Pentax to introduce 'cheap' full-frame mirrorless camera? Could a full-frame Pentax K product be announced next year? 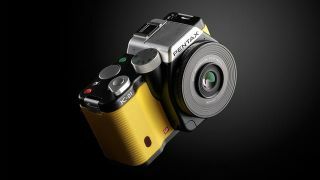 Rumours that Pentax will be introducing a 24 million pixel full-frame CSC have started to do the rounds. Thought to be making its debut by March 2013, the camera would likely be a more affordable competitor to the Leica M9, a premium camera costing around £5000/$7000. For the moment, very little is known about the camera, other than it is expected to feature a 24 million pixel Sony sensor which is thought to also be found in upcoming full-frame cameras from Nikon and Sony. Pentax is known for introducing "different" cameras, unveiling the world's smallest interchangeable lens camera in the shape of the Pentax Q last year. This year marked the announcement of the Pentax K-01, a camera designed by Marc Newson and featuring a large mount compatible with K-mount lenses. Sales of the Pentax Q were disappointing for the company, which was bought out by Ricoh last year. The influence of Ricoh has yet to be really felt on any of the cameras in Pentax's line-up, so perhaps a new full-frame mirrorless could finally see some true collaboration between the two. Keep following for more information as it becomes available.